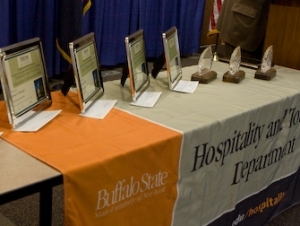 Dan Garvey, food and beverage manager of the Roycroft Inn; Edward J. Healy, vice president of marketing for Visit Buffalo Niagara; and Krista Van Wagner, owner and chef of Curly’s Grill and Banquet Center are the recipients of the 2012 Buffalo Niagara Hospitality Ambassador Award from the Hospitality and Tourism Department. Garvey, Healy, and Van Wagner will be honored at a ceremony at the Burchfield Penney Art Center on Wednesday, April 18, at 5:30 p.m. Students who have received scholarships will also be honored. Cheryl Sosa received the Hart Hotel Scholarship; Jenna L. Aiello, Anna L. Baroudi, Kyle L. Clark, Sara Cucio-Rudy, Nick W. Del Nuovo, and Tiona M. Petty each received a Pano’s Scholarship; and Dan Cycon and Marjorie S. Miller each received a Hospitality and Tourism Department Scholarship. 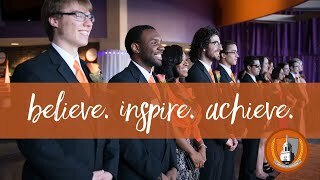 Following the event, award recipients and their guests will enjoy a dinner at Campus House, which was established in 2002 to provide a learning lab for hospitality and tourism majors. Hosting the event and dinner is a culminating project for students majoring in hospitality administration. The cost of the dinner is $50.